For years I used PrintKey2000 for screen capture. Sweet little program. Why did I switch? Simple. This one program does so many things well, replacing several other little programs I used to use. Very lightweight and very little drag on system resources, I am running it all the time. XP, Vista and Win 7 compatible on 32 and 64 bit systems. - PORTABLE! I can take this with me to any computer I work on! "all the required files to run the application independently from any folder you dump it in. Major advantage is that you can carry it around on a memory stick / USB flash drive, or copy / migrate from PC to PC via simple copying of files. No installation is necessary." 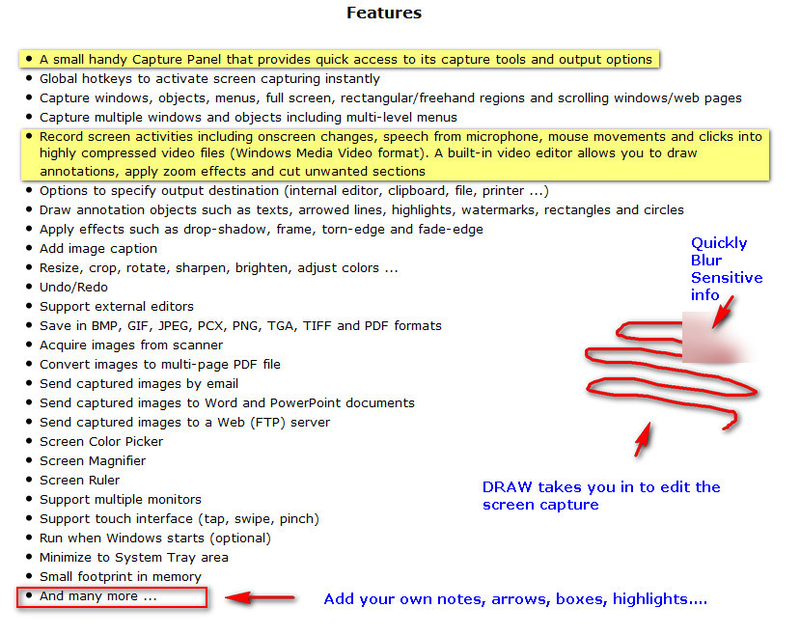 - Screen capture (PrintScr, Alt-PrintScr, etc for full window, menus, with without cursor, options. Extra editing capabilities once item is captured. - Built-in FTP so you can capture, edit and send file to website quickly if needed! - Send image directly to your website using the built-in FTP utility! 30 day trial, then $19.95 and in my opinion, worth it! All upgrades included with purchase. never have to pay again. Nice feature. Glad I got it last month. I have also been using PrintKey2000 for many years. I downloaded and installed Faststone Capture and will give it a try. Initial impression is very good. I especially like the scrolling feature. Thanks for the tip Sami. Ya.. that is one thing that would frustrate when switching between FF and IE. If using Firefox, I could use the plugin to get a full scrolled image, but some sites would not load w/FF. I thought I would not need a screen capture utility once I moved out of XP since Vista/Win 7 offer the Snip Tool. But that thing is limited! Can't believe it is not tied to the PrntScr button! If I had never used PrintKey, then yes the Snip tool would have offered more than the PrntScr windows option. But having been spoiled by PrintKey for so long, I did not want to lose the abilities I had gotten used to! Finding a program compatible with Win 7, with a good rep, no spy/scumware, no/low cost that combines the features I use most into ONE tiny program made it right for me. FYI... I added my Xara Design Premium as the external editor so now my capture/edit screen has a button on it to send the item directly to XDP! Works great. Also in SETTINGS, I made sure that I added the additional buttons to the editor window and to the capture bar. Makes grabbing several images in a row much faster. The included Paint-like editor accessed with the DRAW option is sweet! Line and rectangle highlighter and elipse(no-fill) and logo overlay are EXACTLY what I need. Wish arrow had larger tip. Glad you find it useful too. Let us know if you end up keeping it! Just thought you might like to know that Windows 7 comes with a great little tool called Snipping Tool that can save a screen capture in PNG, JPG, GIF, and MHT. Thanks Ed, I was not aware of the snipping tool. Looks very useful. Ya I tried the SNIP tool before getting my new Faststone capture. And the Faststone capture has the scroll capture. >> software updated.... I have got to replace my copy! paid once....all updates remain free. UPDATED again. 2nd time this year! Just keeps getting better. Besides screen capture, you can record videos with it. And the latest version allows you to put text and arrows on those video captures. And he is making this program Win 8 compatible. I use this portable program everyday in some way: web work, as teaching tool, even when learning a new job to take notes. Buy a license once, keep program for a lifetime free upgrades. Best program purchase I have ever made and HIGHLY recommend it. So tiny & portable, I run it from my usb stick so that no matter which computer I am working on, I have use of this program! I tried the "video edit" feature just now. So simple and easy. Added a highlighted yellow box to a movie. 3) Open the edited file. The highlight is now embedded as part of the movie and can not be edited again. 4) Make new edit like adding circle, square or arrow. Since this was added at different time, it can overlay the earlier edit. And have separate timing. Each time you SAVE, your edits become part of the movie and can not be changed. Keep your original movie in case you need to start over! This FastStone Capture program has been updated again. If you already own a license, you can upgrade for FREE. If not you can get it now for $19.95 with lifetime updates. STILL my favorite tiny program. Use it every day that I am on the computer. I still use the PORTABLE version so I can run it completely on my USB stick. Can take it with me to both my laptops, to family computers, work and client machines while I am working on them. No space taken or anything left behind when I leave. LOVE IT. Oh My... The only program I use more than FastStone Capture is FireFox. I LOVE the ability to add notes, circle, arrow and highlight. Even simple blurring of image details so you can send a pic without your password or other sensitive info. And capture a full LONG webpage picture using the scrolling option. I like ability to set the file name automatically...date included, or numbered order, etc so all images are in order. And the recording option has come in really handy for training/meetings online. I drag existing pics on the floating toolbar and it opens the basic editor. Even though I have Adobe CS4 with Photoshop, Paintshop Pro and Xara's Design Pro software, FastStone Capture is my favorite "quickie". I even can take a screenshot, make notes, then FTP that modified image to samisite in one quick option, all from the same tiny program. I did this in a couple minutes all from FastStone Capture. A new update came out! Time to upgrade again, ALWAYS FREE to anyone that buys the program. Just keeps getting better. - Added "Screen Crosshair". It displays two full-screen intersecting lines (crosshair) on the screen with a magnifier showing the details of the area around the mouse pointer. You may find it helpful to align screen objects, compare chart or tabular data and underline the text you are reading. A new update came out! Time to upgrade again. UPGRADES ALWAYS FREE to anyone that buys the program. Just keeps getting better. I use this program more than nearly all programs on my computer. - Gamma, contrast, brightness and more adjustments under the COLORS item on the menu bar. - Effects options include putting a reflection or edge, or even a watermark on your image. - Draw allows you to INSERT an image, draw, look at the L option to draw a segmented line and ERASE to clear a portion of the image. Hmm, I am still using PrintKey 2000! Maybe I should take a look at FastStone Capture. Omg! That stopped working for me years ago. It was a good practical item. And I really liked it. When it became incompatible, I was heart broken. And the windows SNIP tool is a joke for anyone that used PrintKey. But really, I LOVE LOVE LOVE THIS PROGRAM. Never said that about PrintKey. Best: portability. I get the portable version, put in on my stick and use it on win xp, vista, 7, and 8! No matter where I go, no matter what software the client has, I have MY tool for screen captures, notes. Nothing gets installed, and goes with me. Scroll down to see a sample image I marked up with it in seconds. Can do far more than that shows! I KNOW you will love it. Purchase once for $20, free upgrades. BTW, I have no problem at all in using Printkey with Win 7 - works fine. My PrintKey was not compatible as far back as xp. It even died on my moms xp after a windows update a while back. Maybe we had different versions. I have a friend that used it on vista for a while, then switched to FastStone Capture for the scrolling image and movies. My PrintKey is still working well on both XP and Win7. I like its simplicity, which is why I have not been motivated to switch to anything else yet. faststone capture is just as simplistic as print key. i know what you mean....printkey just print screen and done. dont blame you. December 19th 2014 another update. I finally grabbed it. All updates are FREE to anyone that buys a license.